The client approached me to redesign their website in order to align with business goals while being an optimal experience for the user. The current site was not conveying who they were as a company, not describing the problem that the company is working to solve, and not properly informing users how the company’s services can assist. 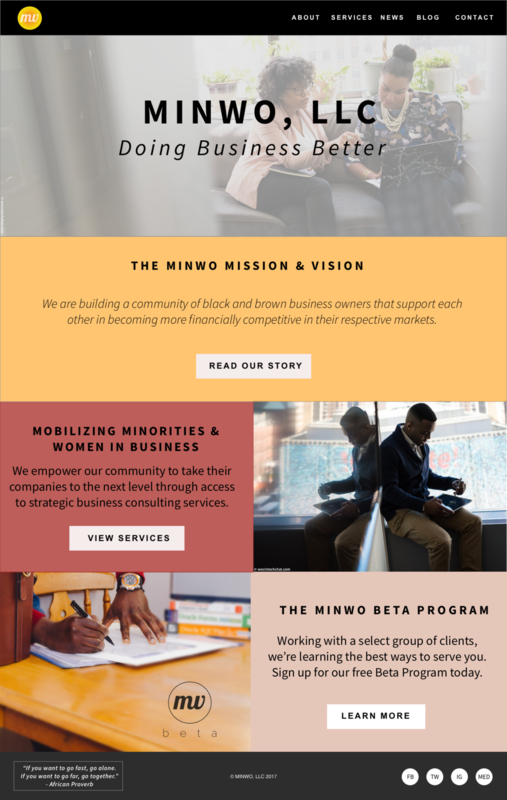 The goal was to ensure that the MINWO website conveyed the mission and the purpose of their company, describe the problem their working to solve, and inform their customers how they plan to serve them. After interviewing all of the MINWO co-founders to properly understand their business goals, their users, and their expectations, and the problems they wanted to solve. I sat down one on one with the CEO to develop a content strategy for the new website to ensure that all the information that is required was outlined. I rearranged these cards a few times to accurately capture what the company needed on each page. After determining the content strategy and redesign for the website, MINWO now has a site that can effectively serve their users.